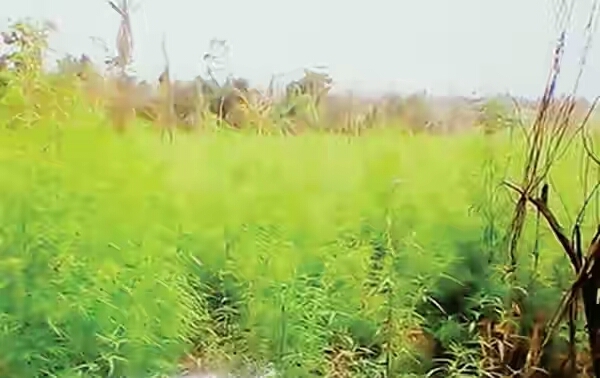 The Osun State Command of the National Drug Law Enforcement Agency, on August 15, 2016, destroyed about 21 hectares of cannabis sativa at the Onikete Farm Settlement in the Isokan Local Government Area of the state. However, about 25 kilometres of land, which is allegedly being used to cultivate cannabis in the settlement, was allegedly spared. It was gathered that the cannabis farm was under the protection of a traditional ruler in one of the communities in the LGA. A source told a Punch correspondent that policemen and some officials of the NDLEA in the state were also part of those protecting the farm. He said another cannabis farm of about 20 kilometres was being cultivated at the Araromi Erinfolami Forest Reserve in the LGA. He said, “The two cannabis farms were ripe and could be harvested by the planters any time from September 10. It was gathered that residents, who raised the alarm, were either victimised, ostracised or maimed. One of such alleged victims is 53-year-old Biliaminu Fatoye, whose cocoa and banana farm at Araromi Erinfolami Forest Reserve were surrounded by cannabis sativa. Another victim is a police officer, who was allegedly transferred from the Isokan Police Division for going after the hemp planters. In September 2015, Fatoye’s shelter in the farm was destroyed by suspected hoodlums. Fatoye said, “On June 19, 2016, some masked men came to attack me around 1am. They fired gunshot at my house. I fled through the back door and handed over my five-year-old daughter to a neighbour. “They set the two-storeyed building I was living in ablaze, and destroyed my property worth about N2.5m. My landlord estimated the damage to the house at N4.4m. “I later reported the matter at the Isokan Police Division. Three suspects were arrested on June 21. They were charged to court and were granted bail. They have returned to the farm. The widower, who had abandoned his farm and house, said he was ready to lead security operatives to the two farms, adding that he petitioned the anti-narcotic agency in Osun State on August 8, but did not get any response. He added that seven days after he submitted the petition, his farm was destroyed. Meanwhile, photographs taken on September 5 by Punch correspondent, who disguised as a farmer, indicated that the two cannabis farms had not been destroyed. “A traditional ruler and some notable persons are protecting the farms and the cannabis planters. They wanted to take over the five hectares on which I planted my crops, but I refused. That was how I incurred their wrath. “I informed a police officer in Isokan. He vowed to facilitate the destruction of the cannabis farms. He was on it when he was transferred to another state,” Fatoye added. The police officer, who spoke with Punch Metro on condition of anonymity, alleged that some NDLEA officials were protecting the cannabis farmers. Another cocoa farmer, whose four hectares of farmland was snatched by the hoodlums to plant cannabis, said he had been living in hardships since February. The NDLEA Head of Public Relations, Mitchell Ofoyeju, said the agency would inspect the two farms and ensured that the plant was destroyed, while the perpetrators would be nabbed. Dear Men, Here's Why You Should Not Eat "Okro"